This Modern style lap quilt was made for a very special mother on the occasion of her 90th birthday. 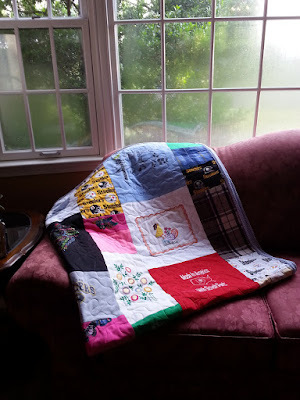 It contains many items of her husbands who, sadly, is no longer with us, her handmade hankies and embroidered cloths that she made many years ago, and Pittsburgh Steeler fabric since she is a diehard fan! We are so grateful that Patti found you and that you were willing to work so hard to create a quilt that will be treasured forever! You do beautiful work and you created the highlight of my mom's 90th birthday celebration! The pillows are the icing on the cake! Thank you for sharing your special talents with us!"